Ever wonder why so many roads in the Pioneer Valley are so wide? Drive on Route 5 between Northampton and Holyoke or Route 10 between Easthampton and Northampton, and running alongside two lanes of traffic is an equally large breakdown lane. Less than a century ago, an electric trolley line ran down the centers of these streets. Horse-drawn carriages and later, for a while, automobiles were pushed to the side in favor of the affordable public transportation that conveyed people all along the Connecticut River. Remnants of this network can be seen throughout the Pioneer Valley. The Holyoke City Public Works department is housed in the former trolley barn, with its numbered bays still visible on North Bridge Street. Not far from where I live, a path runs through the swamps in the Northampton Meadows on a tall earthen embankment where a trolley once ran. I often imagine how, when my house was first built, the people who lived there probably rode the trolley. Where my garage now stands, they probably had a garden. Without ever having to worry about strange sounds coming from their automobile’s exhaust system or having to spend money they didn’t have on new tires, the original occupants of my home were able to travel most places I visit regularly by car and many places I can’t—including places along this verdant path through the wetlands that are now part of the Arcadia Wildlife Sanctuary. Walking there, I envy the conductors whose used to travel that route daily, riding through the fields and forests by the Oxbow and under the morning shadow cast by Mount Tom. While traces of these old systems remain if you know where to look, not everything needs to be left to the imagination. There are two trolley museums a short drive from most places in the Valley—one in Shelburne Falls and the other in East Windsor, Conn.—where you can unclench your fists from the steering wheel, crawl from your car and catch a ride as a passenger on transportation from another era. Both the Shelburne Falls Trolley Museum and the Connecticut Trolley Museum feature functioning electric rail cars that you can touch, climb into and ride. The term “trolley” derives from the wheeled device that runs along a suspended cable, in this case electrified, and which is attached to the vehicle below by a long bar. (San Francisco’s cable cars aren’t, strictly speaking, trolleys because they’re moved by being pulled along by a cable under the road surface.) So in order to provide an authentic experience, both museums have not only had to find and refurbish the cars and maintain a line of track, they’ve also had to rebuild a network of powered cables. In both instances they’re reusing former, active trolley lines. The Connecticut museum has a large collection of cars from different eras and locations, but the No. 10 passenger-baggage car in Shelburne Falls is the only Northeastern trolley that still runs on its original lines. The No. 10 was made in 1896 by the Wason Manufacturing Company of Springfield, a well-known maker of rail cars. It was delivered new to the Shelburne Falls & Colrain Street Railway (SF&C) the same year the railway opened, and its electric lighting and heating were considered state of the art at the time. It was one of only two cars the company bought new and not secondhand. At almost 33 feet in length, it’s among the smallest trolleys built in America, but the officious yellow car stands tall with authority, and the wood, glass and metal interior is warm, comfortable, and full of period detail. Each end of the car has a place where the motorman can operate it, and the interior is divided into two sections: passenger seating and a cargo hold. The railway was built to connect the mills in Colrain to Shelburne Falls, where the Boston & Maine Railway connected the area to the rest of the nation. Along with moving shipments to and from the mills, the trolleys also carried produce from the farms along the route, including milk, cider and vinegar. Originally the trolleys stopped on the Shelburne Falls side of the river, and the freight needed to be taken by horse and carriage over to the Buckland side and up the hill to the rail stop. This problem was solved in 1908 when the SF&C built its own bridge crossing the Deerfield River, just upstream from the falls. The five-span bridge is built at an angle across the river, and No. 10 once took all kinds of passengers and freight over it daily. In its peak year of 1913, the line carried nearly 243,000 passengers—workers, students and sometimes people taking day trips. Trolleys were many Americans’ first experience with motorized travel and in addition to making necessary travel more convenient, they were used for joyrides. Tapping into this new passion, many trolley services built amusement parks as destinations to promote travel along their lines. Six Flags New England in Agawam was originally built to promote rail travel, and SF&C also established a picnic grove at what was roughly the center point in the track between the two towns, known as Hillside Park. With the demise of SF&C in 1928, its fleet of trolley cars was sold off, and No. 10 was repurposed as a chicken barn for a local farm until it was donated to the museum by Marshall Johnson in 1991. Over the next eight years, volunteers brought the badly deteriorated trolley back to life, and on October 9, 1999 it ran again and has been doing so every summer since. Last year, a couple of weeks before Memorial Day, when the museum typically opens to the public, I attended a training session for hopeful conductors and engineers. Somehow I’d deluded myself and a friend (and fellow father) that we’d miraculously find the time to routinely help drive the trolley; while we never achieved that goal, we had a splendid early May day hanging out with the trolley’s family of keepers and enthusiast-wannabes like ourselves. Sam Bartlett, who manages the museum and is an electrical engineer by trade, removed panels inside the trolley and gave us a tour of its inner workings, which he’s in charge of keeping working. He showed us, too, how when the trolley reaches the end of its run and needs to be turned around, the motorman has to leave the car, physically move the trolley from the wire, and rotate the bar that holds it into a trailing position behind the vehicle. Meanwhile, Bartlett’s mom Polly demonstrated the correct use of the antique pump car and gave advice to future operators on how to manage guests and where on the rail it was best to administer the brakes. Alden Dreyer, who was in charge of safety and managing the volunteer staff, collected and corrected the exams from long-time motormen verifying that they remembered the safety rules. Though the stretch of functional track is limited (about a quarter of a mile) and No. 10 is the only electric trolley in the barn, with its wealth of displays and remnants of the old freight house and yard, the Shelburne Falls Trolley Museum gives a rich and layered flavor to the explanation of why this form of transportation delighted and enriched the Pioneer Valley a century ago. The Connecticut Trolley Museum has been around since 1940, when the Connecticut Electric Rail Association (CERA) purchased a 17-acre facility with 3.2 miles of former rail bed in East Windsor for the purpose of preserving something of the trolley-riding experience that had been vital to the region. The track that once ran there was part of the Hartford and Springfield Street Railway system, and midway between the two cities a spur from the main track led to the Piney Ridge Amusement Park. The museum is located on this former spur. Seventy years later, volunteers have restored a mile and a half of track to use and have collected a fleet of classic trolleys on which to ride. CERA’s goal is to eventually finish laying rail on the remaining rail bed, which stretches to the site of the former amusement park, but they’ve already accomplished a lot. In addition to the rail and trolley collection, they’ve built a power substation, a restoration shop, and a storage barn with several non-functioning trolleys to climb aboard. A museum is a short distance from the Windsor Locks exit off Interstate 9, and it also includes antique fire truck collection. Though none of the trolleys were in service in Connecticut and their condition is slightly less pristine than the No. 10 in Shelburne Falls, they offer a longer, more dynamic ride, and each trolley offers a unique experience. The longer track and less delicate trolleys mean that rides can achieve much greater speeds—close to 30 miles per hour—racing through forests, fields, and even crossing a country road (with working railway semaphores holding back auto traffic) before slowing to a halt and changing direction. One ticket provides a day of unlimited rides. In addition to transportation, trolleys also offered the public an opportunity to cool off on hot summer days and nights, and rather than reaching a destination, comfort was the point of some outtings. 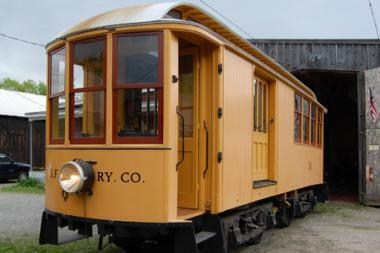 Included in the Connecticut Trolley Museum’s collection is a trolley known as a “breezer,” an open car without any walls, built to take full advantage of the moving air. Theirs is a handsome turquoise car built in 1911 by the Saint Louis Car Company, and it ran in Rio De Janiero up until the 1960s, when it was purchased by the museum. With its pew-like benches and polished copper railings, it remains a joy to ride on a hot day, as is the completely open (no roof, either) sightseeing car that once ran in Montreal. The museum is an easy place to lose track of time, and it keeps all ages engrossed and eager to discover more for hours. The conductors and motormen all take their jobs seriously, are full of interesting information about the age of trolleys, and seem as eager as the passengers to get as many trolleys out on the tracks as possible. A stretch of the track has a siding that allows the trolleys to pass one another, and listening to the volunteers negotiate right of way can be almost as fun as rattling along at grin-inducing speeds.